Delivering continuous, real-time data flow directly toÂ laptop or smartphone, VERITRAX™ provides oil and gas producers with fully transparent, automatic chemical control, monitoring, and ordering system. Automation and cloud-based technologies optimize chemical supply chain, maximize production uptime, and foster understanding and control of chemical spend. Chemical pump control and data analysis help ensure correct chemical is delivered at wellsite and at optimized ppm level dosages. 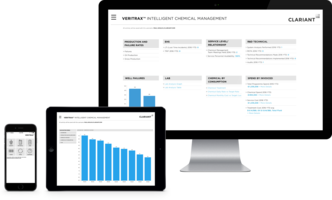 Houston, TX – Clariant, a world leader in specialty chemicals, delivers the efficiency benefits of the digitized world to oil and gas chemical operations with its VERITRAX™ intelligent chemical management system. The VERITRAX solution offers oil and gas producers a pioneering, fully transparent, automatic chemical control, monitoring and ordering system that optimizes chemical management tasks and labor-intensive processes, resulting in a significant reduction in total operating costs. The unique support platform takes advantage of industry-leading automation and cloud-based technologies to optimize the chemical supply chain, ensure maximum production uptime, and provide producers with an unprecedented understanding and control of their chemical spend. The offering, which can be fully integrated into existing production set-ups such as SCADA and DCS systems, provides a continuous real-time data flow that is delivered directly to a laptop or smartphone. It allows customers to monitor multiple data streams, such as well production and chemical injection rates, and to optimize inventory management, with new chemical deliveries coordinated automatically. Additionally, continuous system monitoring alerts the operator to potential problems, allowing rapid interventions to minimize production losses. The VERITRAX system provides precise chemical pump control and data analysis to help ensure that the correct chemical is delivered at the wellsite, at optimized ppm level dosages, to achieve the desired results at the expected costs. The VERITRAX intelligent solution's online surveillance aligns production rate data streams with analytical results uploaded from the field or lab, allowing for trending analysis and the troubleshooting of problematic wells. Jon Rogers, Global Head of Clariant Oil Services, comments: "The priorities for the oil and gas industry are risk management, production efficiency and cost optimization. Information technology is playing an increasingly important role for oil and gas companies as they look for ways to optimize all aspects of their operations. The VERITRAX technology can deliver both cost reduction and increases in operational efficiency to our business partners." Clariant Oil Services is a leading provider of chemical technologies and services to the oil, pipeline and refineryindustries. A global business with headquarters in Houston, Texas, Clariant Oil Services is represented in all major oil and gas locations. From deepwater exploration to refining, Clariant Oil Services provides chemical products and services designed to reduce customer costs, decrease operational risks and improve production efficiency. Clariant Oil Services operates state-of-the-art R&D and applications laboratories in the United States, Scotland, Germany, Brazil and Indonesia, as well as an environmental testing laboratory in Norway. Clariant Oil Services’ industry experience is supported by a dedicated global technical services network, providing a unique position from which to address and resolve customer challenges anywhere in the world, now and in the future.